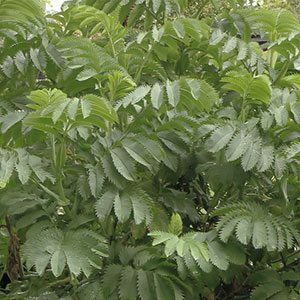 A foliage plant that can be grown at the front of the border as a feature plant, or toward the rear of the border where Melianthus major with its height still makes an impact. The foliage is divided with serrated leaf margins, grey green in colour and with a distinct tropical appearance. In the garden, it is a star in spring and again in autumn. It puts out its tall flower spikes in spring, and these stand well above the foliage. In the garden this is a foliage plant, however the actual look will depend on how, and if you prune it. Pruned back hard each winter, the foliage is close to the ground. However, if treated this way flowering can be limited. You can let the plant grow, and it will form long stems with the foliage held high above. This looks great, however they can fall over, so plant them at the back of the border and give them some support. Grown in a humus rich soil in a sunny to part shaded position this is a very easy care plant. Decide on you pruning regime, and if you decide to prune, the best time is in winter when you would cut it right back to the ground. Position – Full sun to a little shade, best in a warm protected position. Soil – Humus rich moist soil. Foliage – Greyish green, deeply divided, when rubbed it has a rather unpleasant odour, hence one common name of ’Touch Me Not’. 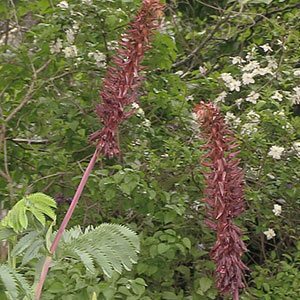 Flowers – Deep red to brown tall spikes.